Home page > Blogs > Quarto Cooks > Cooking Tips > What are Flavor Bombs? Looking for a great way to save time, money, and food? The answer is Flavor Bombs. They’ll make your meals easier, and much more delicious. But what are they and how do you make them? Cooking with Flavor Bombs gives you the lowdown. Flavor Bombs are combinations of savory, sautéed aromatics, fresh herbs, or sauce reductions blended together and frozen in ice cube trays, small containers, small bowls, or even just spooned onto a tray lined with wax paper. They are also a great way to reuse plastic containers, such as small sauce containers with lids and egg cartons. Once they’re frozen, you transfer them to an airtight container or resealable freezer bag and they’re ready to add a flavor explosion to your meals. The ingredients are chopped by hand, in a food processor, or even pounded with a mortar and pestle, depending on how rustic or refined you want your Flavor Bomb blends to be. Fresh ingredients may be preferable but using pre-prepped, chopped vegetables in containers or even frozen vegetables will produce very similar results. The herbs, however, should always be fresh. Making Flavor Bombs is an excellent way to take advantage of specials in your market’s produce department. Stock up, chop up, and free up time and money! Go that extra mile when you buy that pricey batch of herbs or exotic vegetable, make enough for leftovers, and then make a Bomb out of it. A successful flavor bomb includes the five basic tastes: sweetness, sourness, bitterness, saltiness, and umami. Along with the other ingredients in your dish, you may detect these flavors now more than ever since you are creating the background or building block of the dish with Flavor Bombs. By the way, spicy is not a taste, it hits the pain receptors, not the taste buds—so go as spicy as you dare! Sweetness: Found in “sweet” vegetables, such as onions and carrots, sugars are drawn out when these vegetables are caramelized. Sourness: Found in vinegar and lemon, sourness brings a brightness to the tongue, which contrasts nicely with rich, savory flavors and can help cut through fattiness. Bitterness: Different than sourness, bitterness can be considered unpleasant but yet rounds out richness and adds another dimension of taste to dishes. It is found in citrus peel, herbs, and leafy greens. Saltiness: Identified with foods containing sodium, such as soy sauce, miso paste, and even celery, salt harmonizes and brings out the flavors of foods when used in moderation. It shares some characteristics with umami. Umami: This Japanese word means “yummy” or “delicious” (and it is). Umami has a meaty, savory taste that is found in miso paste, soy sauce, tomato paste, and dried mushrooms. I have included three types of Flavor Bombs in this book—Herb Pesto, Vegetable Blend, and Stock and Sauce—that represent flavors from around the world. I have also included recipes with all of the Bombs to get you started, but feel free to experiment with your own blends. Gardeners know Flavor Bombs. Chefs know Flavor Bombs. And now you, too, can learn the secret to delicious, no-waste dinners! If you’re tired of chopping fresh veggies and herbs night after night or throwing away extra produce, then it’s time to revolutionize your cooking with Flavor Bombs™! 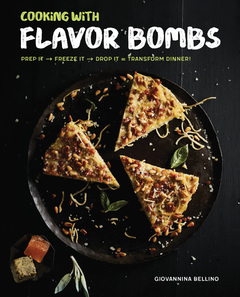 Cooking with Flavor Bombs is complete with essential Bomb step-by-step instructions plus delicious recipes to use your Flavor Bombs in, including Spaghetti Frittata, Roasted Pork Loin, Pot Pie with Guinness Stout and Cheddar, Chicken Tikka Masala, and more. So stop wasting time, money, and food, and start cooking with Flavor Bombs today!